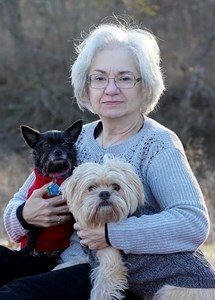 Mary Beth Knight, 69, formerly of Topeka, passed away on March 27, 2019 in Neosho, MO. She was born on July 22, 1949 in Tulsa, OK the daughter of Alfred B. Knight, Sr. and Patricia J. (Dunn) Knight. She graduated from Central High School in 1967 and went on to attend Tulsa University, where she studied art. Mary enjoyed reading, many kinds of art, nature, and animals of all kinds. Above all else she enjoyed spending time with her family. She worked for Wal-Mart for over 28 years in overnight stocking and fabrics and crafts. Survivors include siblings, Alfred B. Knight, Jr. and James P. Knight; nephew, Brian Knight (Jeannette); as well as several great-nieces and nephews. She was preceded in death by her parents; as well as siblings, Martha Leta Knight, Rebecca Jean Knight, Grover E. Knight; and a niece, Allison Marie Knight. Graveside services will be held at 1:00 p.m. on Monday, April 1, 2019at Mount Hope Cemetery & Funeral Chapel, 4700 SW 17th Street, Topeka. Penwell-Gabel Mid-Town Chapel is handling arrangements. To leave a special message for the family, please click the "Share Memories" button above. Add your memories to the guest book of Mary Knight.